Today, digital tools like 3-D printing, animation and virtual reality are more affordable than ever, allowing mathematicians to investigate and illustrate their work at the same time. Instead of drawing a complicated surface on a chalkboard, we can now hand students a physical model to feel or invite them to fly over it in virtual reality. Last year, a workshop called “Illustrating Mathematics” at the Institute for Computational and Experimental Research in Mathematics (ICERM) brought together an eclectic group of mathematicians and digital art practitioners to celebrate what seems to be a golden age of mathematical visualization. Of course, visualization has been central to mathematics since Pythagoras, but this seems to be the first time it had a workshop of its own. Visualization plays a growing role in mathematical research. According to John Sullivan at the Technical University of Berlin, mathematical thinking styles can be roughly categorized into three groups: “the philosopher,” who thinks purely in abstract concepts; “the analyst,” who thinks in formulas; and “the geometer,” who thinks in pictures. Mathematical research is stimulated by collaboration between all three types of thinkers. Many practitioners believe teaching should be calibrated to connect with different thinking styles. Sullivan’s own work has benefited from images. He studies geometric knot theory, which involves finding “best” configurations. 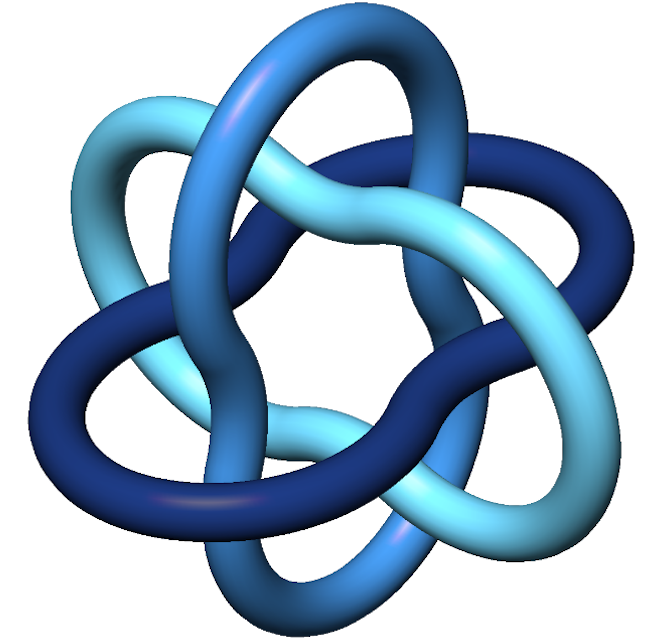 For example, consider his Borromean rings, which won the logo contest of the International Mathematical Union several years ago. The rings are linked together, but if one of them is cut, the others fall apart, which makes it a nice symbol of unity. Take mathematician Fabienne Serrière, who raised US$124,306 through Kickstarter in 2015 to buy an industrial knitting machine. Her dream was to make custom-knit scarves that demonstrate cellular automata, mathematical models of cells on a grid. To realize her algorithmic design instructions, Serrière hacked the code that controls the machine. She now works full-time on custom textiles from a Seattle studio. Mathematical algorithms power the products made by Nervous System, a studio in Massachusetts that was founded in 2007 by Jessica Rosenkrantz, a biologist and architect, and Jess Louis-Rosenberg, a mathematician. Many of their designs, for things like custom jewelry and lampshades, look like naturally occurring structures from biology or geology. Farris’ essay is a fascinating look at mathematics and data visualization. This entry was posted in Mathematics, visual data and tagged 3-D printing, animation, architectural drilling machine, Borromean Rings, custom-knit scarves that demonstrate cellular automata, data visualization, differential geometry, Edmund Harriss, Fabienne Serrière, Frank A. Farris, geometric knot theory, Illustrating Mathematics, Institute for Computational and Experimental Research in Mathematics (ICERM), International Mathematical Union, Jess Louis-Rosenberg, Jessica Rosenkrantz, John Sullivan, mathematical models of cells on a grid, mathematical sculptures from wood, mathematical thinking styles: the philosopher who thinks purely in abstract concepts the analyst who thinks in formulas the geometer who thinks in pictures, Nervous System, paths of steepest descent, Pythagoras, Santa Clara University, Technical University of Berlin, University of Arkansas, US, virtual reality on May 16, 2017 by Maryse de la Giroday.